Whey Isolate with the highest PDCAA(Protein Digestibility corrected Amino Acid) score of 1, the only source in whey gold ensures the highest qaulity of protein is available to the customer for consumption. . This helps speed up the rate of muscle recovery, post exercise and delays the onset of fatigue. Customers should mix 1 scoop (30g) in 180-200 ml water for best results. 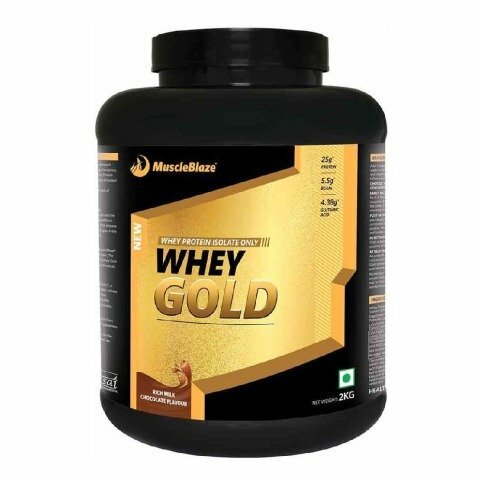 Whey gold is powered by the purity of whey protein isolate, the purest protein and has set a higher benchmark of purity for other proteins. To Recieve updates and possible rewards for MuscleBlaze Whey Gold, 4.4 lb Rich Milk Chocolate please sign in. To Recieve updates and possible rewards for Diet Supplement please sign in.